Whilst I didn't Officially Publish my Site until March 2013, I did run a few test posts in December 2012. Including some Free Crochet Patterns you will only find on this blog (no PDF versions are available for them at this time). Otis Giraffe - Amigurumi CAL Starts Soon! St. Patty's 2017 + 4th Blog Anniversary Sweepstakes & SALE! Happy International Woman's Day 2017! Top 10 Crochet Pattern Round Ups - 2016! 10 Most Viewed Posts of ALL Time - 2016! Fall into Christmas - BONUS Prize Winners! Fall into Christmas - REST Category Winners! Fall into Christmas - STYLE Category Winners! Fall into Christmas - TOY Category Winners! Fall into Christmas 2016 - VOTE TOY! Fall into Christmas 2016 - VOTE STYLE! Fall into Christmas 2016 - VOTE REST! Fall into Christmas 2016 - VOTE for Your Faves! Meet the Fall into Christmas 2016 Contestants - Names P-W! Meet the Fall into Christmas 2016 Contestants - Names L-N! Meet the Fall into Christmas 2016 Contestants - Names D-K! Meet the Fall into Christmas 2016 Contestants - Names A-C! SALE + Happy Thanksgiving 2016! Celebrating 3 Years of Sales with 3 WEEKS of Promotions! It's Time to Cast Your Votes for the 2015 Contest! Who is the Winning Lion Contestant? What I'm Thankful for Giveaway! Who is the Winning Monkey Contestant? Your Favourite Link Parties are here! Who is the Winning Turtle Contestant? Combo Pattern Packs for a Steal! Happily Ever After is 1 Years Old! What's Your Happily Ever After Style? Crochet Chess Set Pattern is 2 Years Old! Discover How Many Pics I Took & If You Won! How many WIP Tutorial Pics did I take this weekend? Do I have Your Favourite Animal? 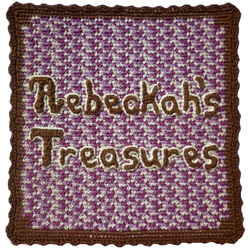 25 Years for Me + 2 Years for Rebeckah's Treasures! Only 2 Months 'til Christmas 2014!!! 2K FBF Winners & a Special Offer! My Store has a NEW Look! Pumpkins Galore! has been Updated! Buy Happily Ever After & Get a Free Pattern! FLASH SALE - Chess Pattern! 22 Vender Crochet Pattern GIVEAWAY! I love Bundles on Ravelry! Crochet Pattern Survey - What Shall I do Next? Last of the Dresses & Tops for the Pattern are Done! 18 Fun, Quick & Easy Crochet Patterns! 1st Anniversary Week 2 Specials! 1st Anniversary Week 1 Specials!